You closed on a new mortgage four months ago and all of a sudden you get a letter in the mail saying your loan was sold to a different company. What gives? This happens quite a bit in the mortgage world and is more common than people think. The good news is there is nothing to worry about. The terms of your loan will not change. Just who you send the check to. And the reason why your loan was sold really comes down to one thing. Money. Your mortgage is worth a lot of money to investors and banks. You probably understand this as when you closed the loan it showed how much interest you will pay over the life of the loan assuming you stay in it. Wouldn’t it be nice to be the bank collecting all of that interest? Depending on the goals of the mortgage company you closed with they can either collect the interest for the long run or sell it for quick cash. And where they sell it at is the secondary market. AKA – the stock market. The financial market is where securities (mortgage notes) that have already been issued by private or public offerings are traded. As you probably already know, investors are buying and trading everything there. Banks and investors get pushed by the share holders to make a great return on their shares invested with the bank. Share holders invest with the banks to earn dividends and stock value. The rate of return your mortgage is worth depends on the interest you are paying. Assuming you’re paying 4% on a 30 year fixed rate mortgage is not all that great of a return for the investors. After paying employees salaries and overhead costs the banks make half of what the mortgage is. Don’t worry about the banks. They are still making a ton of money collecting payments. It’s common for smaller mortgage companies to have one investor buy all of their 30 year fixed mortgages, one that buys their adjustable mortgages, one that buys their home equity lines of credit, and so on and so on. Lets assume in this example your loan is sold. A mortgage company originates your loan and sells it to a larger bank, investors, or a hedge fund. Each mortgage out there has a price tag for the mortgage company to earn. A conventional 30 year fixed rate mortgage where the home owners are doing a full documentation loan is worth 2%. What do you mean by 2%? Here is how it works. The mortgage company has a working agreement with investors who will pay them a 2% premium for that loan within 30 days of closing. A $100k loan x 2% = $2k. So the investor writes a check for $102k to the mortgage company. $100k for the balance + $2k to buy it from them so the investor can earn interest on it. If you start adding up the amount of loans a mortgage company originates in a month this revenue can start adding up. 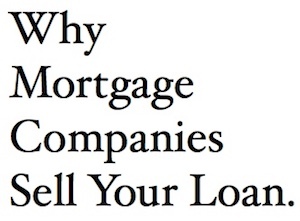 Major mortgage companies do billions of dollars a month in new loans. Lets say they do $2 billion one month. So that’s $2,000,000,000 x 2% = $40,000,000 in revenue for the company. In that example the mortgage company prefers to get quick cash versus collecting interest long-term. In most cases it takes collecting five months of interest payments to equal what they could get selling the loan 30 days after closing. And that example is dealing with your average run of the mill 30 year fixed rate mortgage where the borrowers document everything. When I was a mortgage banker I heard investors were buying subprime loans (which we did very little of) at 4% premium. At 4% premium you can see why there were stories about shady mortgage brokers and mortgage companies steering people into those loans even if they could have been approved on a regular loan. Same work but twice the pay for those mortgage companies. And the investors loved the subprime loans because interest rates were 2% – 4% higher than regular loans. They loved those right up until the point where people stopped paying back the loans. Lets figure out a break even point for the investor. Let’s say you are paying 6% on a 30 year fixed rate mortgage with a loan amount of $100k. Over 30 years you will pay $115,838.19 in interest on the original $100k. That’s right, you will pay $215,838.19 for your $100k loan over 30 years. Your monthly payment on this loan is $600. Of which $500 is interest and only $100 goes towards the principal for the first year. The investor will break even on the 2% premium it paid to the mortgage company which originated the loan on month 4. And from there on it collects your $500 a month in interest. The amount of interest you pay goes down and the principal you pay goes up over the years. Doesn’t this kind of make you want to be a bank? Just go out there and collect about $2 million dollars worth of loans and live off the interest people pay you. If you had $2 million in loans at 6% you would earn $10,000 in interest every month and earn $2.3 million dollars in interest over 30 years. I think you could live off of that. Why would any mortgage company sell the loan when the math shows they are losing out on so much money over the life of the loan. It is easy to see they would make a boat load of money cashing your monthly mortgage payment and doing nothing else. The reason is because of risk. As long as the home owner makes 4 consecutive payments and does not go into foreclosure or refinances that loan then all responsibility is now on the investor (new mortgage company). If one of those events happens before the 4 months than the mortgage company your loan was sold to can call up the original company and ask them to pay them back. You can see why a lot of mortgage companies would rather be in the business of originating and selling loans versus collecting mortgage payments. Once four payments have been made they can get it off their books and never have to worry about the home owner going into foreclosure. There might also be instances where the mortgage company that originated your loan is small and wants to grow. Maybe they do not have a servicing department yet. To get to that point they need to sell the loans to raise capital to build the servicing department. This really is the end goal for most banks and mortgage companies. Originate and sell loans in the beginning. Then originate and keep the good loans. Then originate and keep all the loans. If the smaller banks are off the hook, why did they need TARP money? Good question. Maybe they don’t have enough business coming in to keep them afloat. Even though they sold the loan for a quick profit does not mean they are making a bunch of new loans. Some of the smaller banks work hand in hand with much larger banks and maybe their line of credit was taken away because the larger bank has been hurting.